In a packed house on Saturday night I had the pleasure of watching some exceptionally talented young singers tackle one of Verdi’s most impressive and difficult tragedies with an ease and finesse that rivals… well, almost anywhere. This tiny opera house, with capacity seating for 120, is one of upstate New York’s best kept secrets. Attending a production here is like having a guest orchestra in your living room; with surround sound and front row seats. No need to get dressed up, and the cost of attending is cheaper than a good bottle of wine. Director, Kirk Jackson, sets his Rigoletto in the seedy backstage world of a traveling circus- a savvy choice which undoubtedly saved money on costumes and props and yet still serviced the story quite well. The bare-bones set is a three leveled terraced affair devoid of much else except for a few well- worn circus-type banners which are removed throughout the piece as the plot devolves. There is a small aerie which suggests sleeping quarters, and large-bulbed festive strands of lights are strung out over the audience and used to great effect when the power cuts out during the infamous storm. The twenty piece orchestra is nestled onto the stage (behind the singers) and Maria Sensi Sellner masterfully delivers a smooth and balanced performance. Jackson’s staging is detailed and natural with great attention to character. 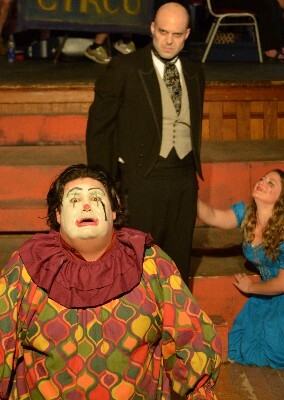 His Rigoletto is not deformed, but is belittled and cowed by having a job he dislikes. By making Rigoletto “everyman” who ever had to wear a mask or play a role untrue to himself, Jackson reminds us that the tragic flaws– overbearing love and a unquenchable thirst for vengeance- are perhaps not as far away from us as we might think. Just as important though are the brief moments of levity in this piece. Jackson brings out the comedy where he can be it through a gum chewing Giovanna who also doubles as a false bearded lady, through a horse head placed on Rigoletto as a blindfold, or through delicious chorus choreography. 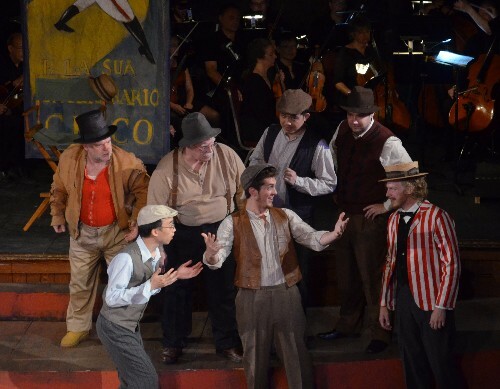 The audience remains riveted for the entire performance because of variety such as this and the singers universally rose to the acting challenge. The freshness and energy of this troupe can be attributed to the fact that every single one of the six leading singers are debuting their roles, and these are certainly roles they will reprise again and again throughout their careers. You can say you heard them here first, because some of these singers are going places. Daniel Oakden sings Monterone (the sorcerer and original vengeful father) with verve and delivered the curse on Rigoletto with perfect contempt and conviction. His appearance is a high point of the first act. Christopher Lucier as the philandering Duke (ringmaster of the circus) cuts through the orchestra with nary a crack although at times you can see him pull his focus inwards as he navigates the tricky tenor passagio. 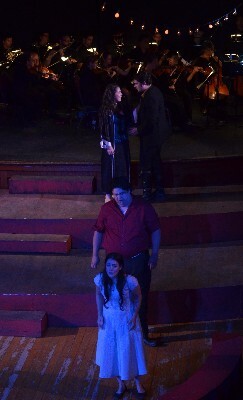 Paul An’s dark and rumbling Sparafucile (the knife thrower) was particularly nefarious and was complemented quite well by Monica Soto-Gil’s sultry mezzo as the temptress sister, Maddelana. 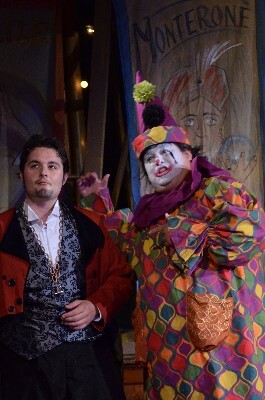 Ben Bloomfield as Rigoletto is a sight to behold. He is a huge man and yet moves with ease, even crawling across the stage while begging the roustabouts to return his precious daughter. His voice fills the Hall and while he will probably be more impressive in this role two years from now as his top evens out, there were moments already that took your breath away- especially if you were sitting front and center as I was. Mr. Bloomfield also had a magical chemistry with his Gilda. The tenderness he exudes as he dances with his daughter, as he forgives her for falling in love with the Duke and finally as he holds her dying body to him is worth the price of admission in itself. I was close enough to see that he actually cried real tears, sniffed, wiped his nose and then still managed to thunder out an impeccable heart-wrenching final lament. Last but not least, the star of the evening was most certainly the petite powerhouse Meghan Picerno whose voice could easily fill houses twenty times as large as Hubbard Hall, and whose Gilda spun with such a magnitude of colors and textures that the audience seemed to never want to cease applauding. In her, you will hear and see what it means to be an artist. 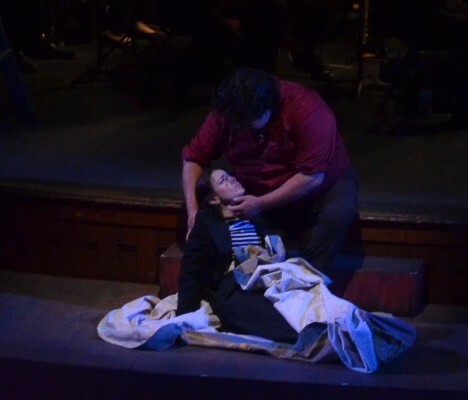 Rigoletto plays for three more performances. Get your tickets early. I should mention here that Hubbard Hall also sponsors a young artist training program which runs in conjunction with the mainstage production. The fruit of this conservatory is the short Menotti piece The Old Maid & the Thief with piano and cello which will play on the off-nights from Rigoletto. 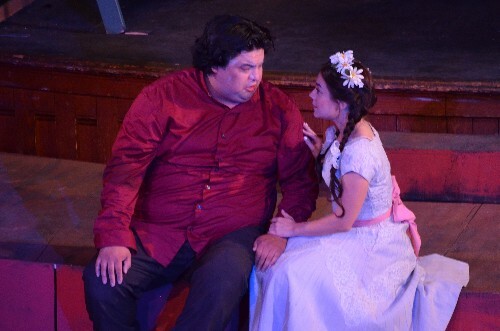 While I will not have a chance to catch this second-stage production, I can say that the lead in that performance will be sung by Stephanie Polonio who also plays Giovanna in Rigoletto with excellent comedic timing and a light but grounded young mezzo voice. Additionally, one of the supporting female roles in Old Maid will be played by Erin Brittain who sings the role of the Countess in Rigoletto with a clear soprano and expressive acting. If the quality of these two ladies is anything to judge their fellow conservatory cast members on, I am sure that Old Maid & the Thief will be quite the success.